The Islamic State’s Wilayat Sinai (formerly known as Ansar Bayt al Maqdis, or ABM) recently took credit for the murder of William Henderson, an American who was killed on Aug. 6, 2014. 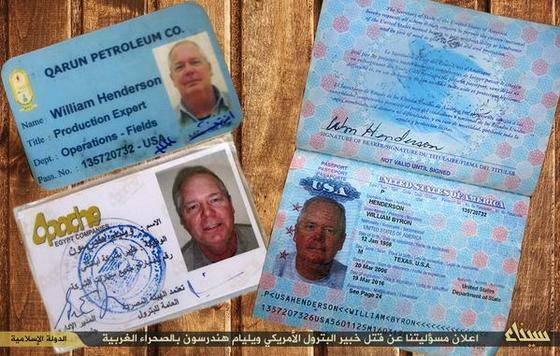 On its official Twitter page, Wilayat Sinai posted a photograph of various identification cards belonging to Henderson (see picture above). The pictured documents include his employee cards for Qarun Petroleum Company and the Apache Corporation, as well as his passport. According to a translation by the SITE Intelligence Group, Wilayat Sinai said that Henderson was killed in Egypt’s western desert, but did not give much more information about the slaying. Henderson worked as a “petroleum expert” for the two aforementioned companies when he was reported to have been killed in a carjacking in August. Press reports indicate that Apache released a statement confirming one of its employees had been killed. An obituary published in Oklahoma noted that Henderson “passed suddenly” while working in Egypt. Henderson is the first American the Sinai group has killed. The terrorist group did not indicate how or where Henderson was killed, but it is generally thought he was killed near Cairo, in between Qarun and Karama. The United States has not yet commented on the claim of responsibility. The attack took place before ABM swore allegiance to the Islamic State, an al Qaeda offshoot that controls large portions of Iraq and Syria. On Nov. 10, an unidentifed jihadist released an audio statement on Twitter pledging bayat (oath of allegiance) on behalf of ABM to Abu Bakr al Baghdadi and the Islamic State. Shortly thereafter, the jihadist group began to identify itself as the Wilayat Sinai (Sinai Province) of the Islamic State. And the Islamic State’s supporters are attempting to turn the Sinai into a jihadist destination for young recruits.